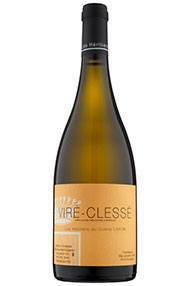 Viré-Clessé became an appellation in its own right from the 1998 vintage, coupling two of the best terroirs among the Macon Villages. This appellation deserves to be better known. There are some beautifully satisfying white wines to originating from its vineyards, especially when made by the talented Bret Brothers duo. Dominique feels that he has tamed the hedonistic exuberance of this appellation, dividing his vineyard into distinct parcels and harvesting each when it reaches ripeness. The result is a wine with perfect weight and a seductive texture. Drink 2019-2023. In September 1999 the Lafon family bought a domaine at Milly-Lamartine, renaming it Les Héritiers du Comte Lafon. In May 2003 a further six hectares in the villages of Uchizy and Chardonnay were added, followed by Viré-Clessé in 2009 and Prissé, PouillyFuissé and St Véran in 2014. The whole operation, based at Milly, is now looked after by Caroline Gon under the supervision of Dominique Lafon and totals 26 hectares. The vineyards are now biodynamic, and the wines are vinified partly in stainless steel, partly in large wooden foudres and partly in demimuids, depending on the cuvée. It hailed a little in St Véran. Harvest began on 15th September, finishing with the Mâcon-Bussières on 1st October, allowing Dominique and his cellar master, Caroline Gon, to pick each of their parcels at the perfect level of ripeness. Caroline explained that the acidity levels of the 2016s are not dissimilar to those of 2015, but that the lower alcohol means the wines feel fresher and more energetic. In 2017 this vineyard was harvested on seven different dates to ensure optimum ripeness. The nose has a touch of the exotic, but with more restraint than in the past. The palate has a salty freshness running through, with saline, iodine notes accompanying the powerful structure and a chewy finish with plenty of dry extract. Dominique thinks it’s the best Viré he has made. Drink 2020-2026. The hot and dry conditions of summer 2017 have yielded mixed blessings; the wines are deliciously ripe but the volumes have suffered a little due to drought stress. Picking began early (at the end of August), with the resulting wines being described by Caroline as of really high quality, with good balance and maturity. Dominique and Caroline take great care to pick each parcel (and indeed sub-parcel) at precisely the right time to ensure optimum ripeness.